The National Association of City Transportation Officials (NACTO) has released a new design guide to help cities prioritize transit on their streets. 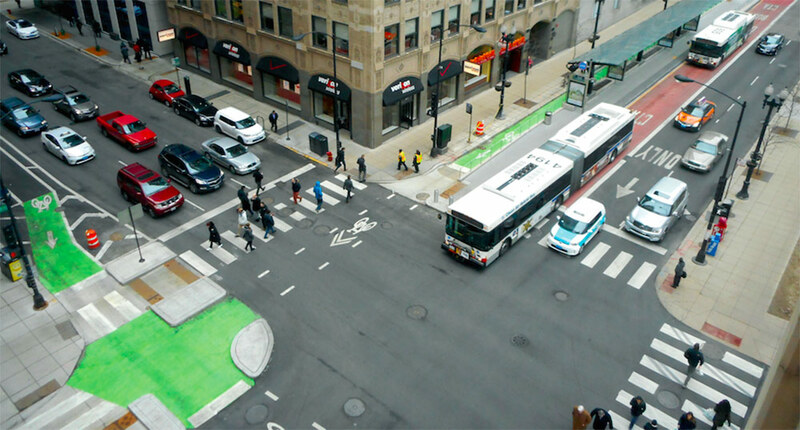 How can cities integrate bus rapid transit with protected bike lanes? How can bus stops be improved and the boarding process sped up? How should traffic signals be optimized to prioritize buses? The Transit Street Design Guide goes into greater detail on these questions than NACTO’s Urban Street Design Guide, released in 2013. Before the publication of this guide, city transportation officials looking to make streets work better for transit still had to hunt through a few different manuals, said NACTO’s Matthew Roe. For example, the guide lays out how to design boarding areas where buses can pick up passengers without pulling over to the curb and then waiting to reenter traffic—which can slow service considerably. Many of the finer points in the guide involve making transit-priority streets that also work well for walking and biking. The image below, for instance, shows the intersection of a sidewalk-grade two-way bike lane with the pedestrian approach to a bus stop. Following the release of the guide, NACTO will be working directly with three selected cities—Denver, Indianapolis, and Oakland—on a “Transit Accelerator Program,” customized assistance to bring better transit streets to fruition. The full Transit Street Design Guide can be purchased from Island Press. I really dig the Chicago example. Smart, high capacity, high visibility infrastructure investment on relatively narrow downtown streets. People get priority here. And those lane markings are so fresh. I can see the simpletons driving in the bus lane without a care in the world.